Robert Sobków, Director of IWNiRZ; Duane Sinning, Colorado Department of Agriculture; Bob Hoban, International Hemp Solutions. Poland’s state-owned Institute of Natural Fibers & Medicinal Plants (IWNiRZ) said it has signed a contract with two US-based hemp firms to sell certified planting seed in The Americas. IWNiRZ also will work with the U.S. companies on cultivation research, the parties said in a press release. The first deal signed among the parties involves a long-term, exclusive contract to provide Białobrzeskie sowing seeds – a Polish hemp seed and fiber variety. Plans call for IWNiRZ to provide an initial shipment of 40 tons, followed by a 150-ton shipment before eventually ramping up annual shipments to 250 tons annually. The parties say their joint research will be aimed at developing new hemp varieties and boosting crop output. 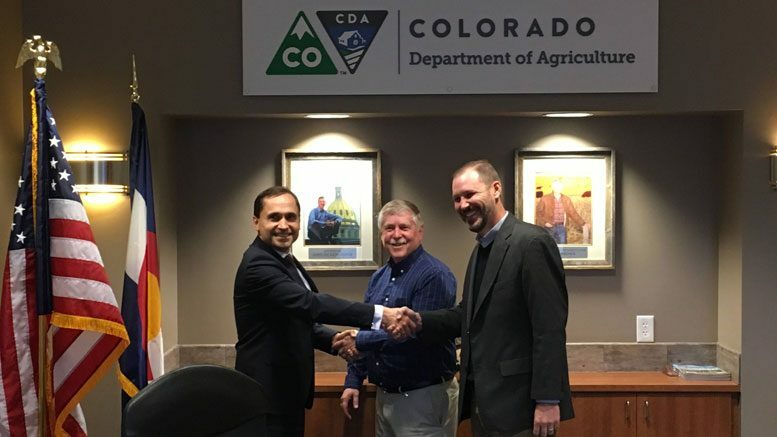 Bialobrzeskie and the Polish hemp strains Tygra and Beniko already have passed the seed certification program under the Colorado Department of Agriculture (CDA). CDA said the strains performed better than others as per the program’s standards, according to IWNiRZ. IWNIRZ has nearly 90 years experience in the cultivation, breeding and processing of industrial hemp. The state-owned institute operates under the Polish Ministry of Agriculture. The Institute announced earlier this year that it had developed Henola, a new hemp variety that produces four times more seed yield for edible oil than typical hemp plants. IWNiRZ said the agreement with the Americans meets Polish agriculture priorities for trade development and access to export markets, and implements provisions of the Ministry’s programs regarding the development of Polish seed and seed exports. The institute said the resulting growth in demand for seed will cause a “significant” increase in Polish hemp fields and the development of Polish agriculture in terms of higher profitability, biodiversity, and market expansion. To help meet the demand expected from the deal, IWNiRZ said it will provide subsidies of up to 1,000 Polish złotys (about $283) per hectare (2.5 acres) which could come on top of EU subsidies already available to Polish farmers.